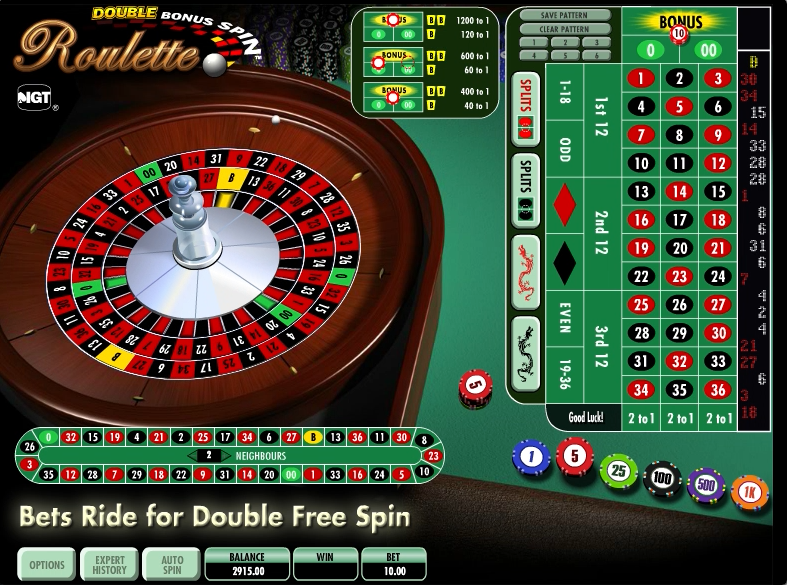 You may have played single roulette and you may have played double zero roulette but if you’re never tried Double Bonus Spin then you’re missing something of a interesting twist. As well as the two zero slots, there’s also a yellow bonus slot which triggers a free spin bonus feature. 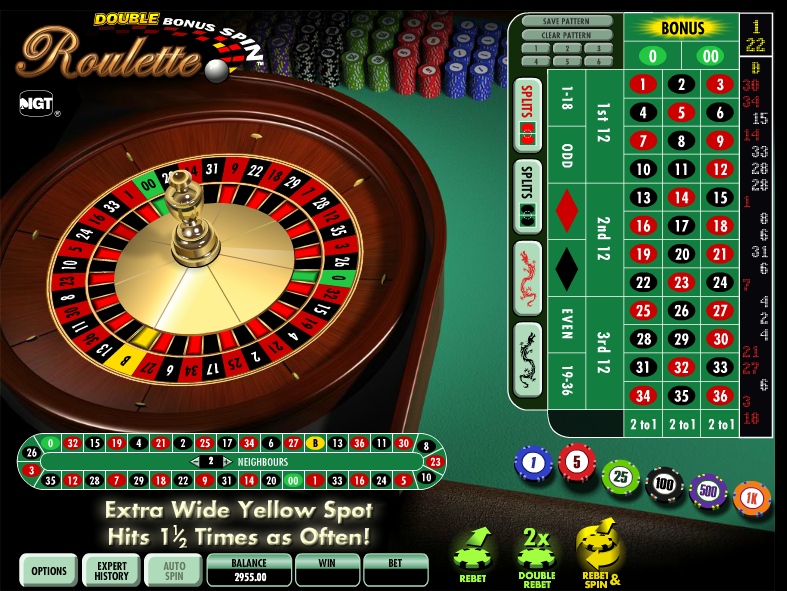 When you first load up the game you will see the nicely animated roulette table on the left hand side with the yellow bonus slot clearly visible. It’s 1.5x bigger then the other slots, giving players a greater chance of landing there. On the right hand side is the betting table including the opportunity to bet on the bonus slot; on the far right hand side is the result of the 24 most recent spins. Get things started by selecting your chips size from those available at the bottom of the screen and click on the required spot on the betting table. All the standard simple best are available along with more complex ones such as splits (betting on both numbers where two reds or blacks touch other) or the dragon (a zig zagging trail of red or black numbers). The French racetrack option is also available underneath the roulette wheel and this enables players to easily bet on a selection of neighbouring numbers on the wheel. This is what differentiates this game from other roulettes and landing on that yellow bonus slot will start this mini-game. You do not have to be betting on the bonus slot to trigger this feature. If you manage to land the ball in there then the standard wheel will drop away to replaced by two concentric reels; these will spin independently, along with one ball. The slots that line up with the ball will pay out and your betting positions from the triggering round will remain. This may not be one for the roulette purists but it’s quite good fun, especially if you can hit that yellow spot. The RTP of 98.06% is even better than the standard casino version of 97.30% so this is well worth checking out.